Transmission electron microscopy (TEM) is similar to SEM in that it uses a beam of electrons to study the sample, but in this case the beam of electrons passes directly through the sample to reach the electron detector. TEM images are able to provide higher resolution than that attainable using a light microscope. The first transmission electron microscope with a resolution greater than that attainable with a light microscope was built in 1933, and there have been commercial TEMs available since 1939. So while it may seem like a very advanced technology, TEM is, in fact, quite an old technique. 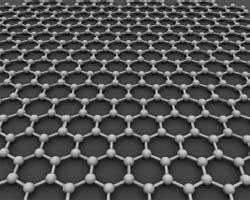 Graphene is a material made of carbon arranged in a flattened buckyball pattern. It has many potential uses in electronics and other mechanical and engineering applications.